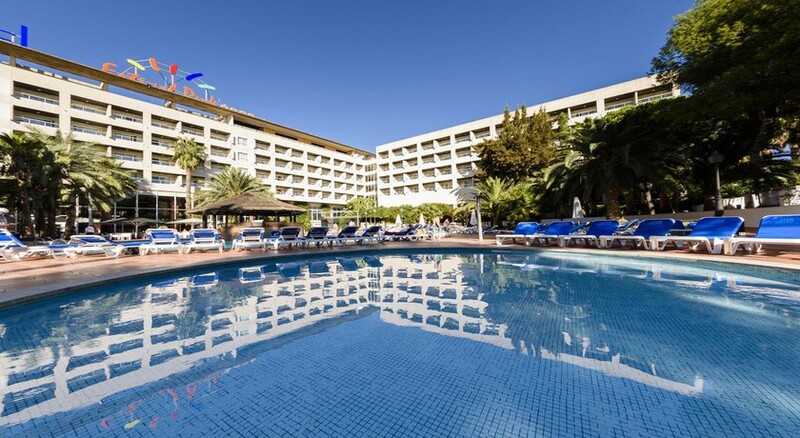 A total of 899 well-equipped guestrooms in a whopping 110,000 square metres of area overlooking the sparkling Mediterranean shore – Estival Park is the perfect Spanish vacation paradise in the popular resort town of Salou in the Tarragona province. 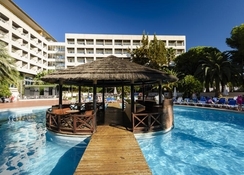 This family-friendly hotel boasts three 4 storey modern buildings and one 2 storey building that consist of a range of delicious dining options, social bars, disco, indoor heated pools, a gymnasium and a sports centre. The accommodation at Estival Park all-inclusive is divided into three categories – single rooms, standard twin rooms and duplex rooms. These rooms come with a private terrace, air conditioning, hair dryers, satellite TV and safety deposit box. The 3 restaurants at Estival Park Salou serve a delicious Mediterranean buffet for breakfast and dinner. The hotel also runs an à la carte pizzeria section during high season. With 4 swimming pools, 3 pools for children, loungers, sun deck and a children’s park, the resort hotel has got something for everybody. Besides this, the health and wellness centre at this splendid retreat offers hydro massage, beauty therapies and a medicinal spa. Estival Park is a 5 minutes’ walk from the famous Raco beach in La Pineda. 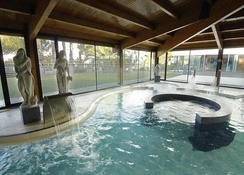 The nearest airport Reus is an hour drive from the hotel. There are three golf courses near the hotel -- 18-hole courses in Reus and Mont-Roig del Camp, and the nine-hole Club de Costa Dorada near Tarragona. This plush property is just 302 metres from the Aquopolis Waterpark, and you can drive to Port Aventura Theme Park in less than 15 minutes. Among the other things that make Estival Park in Salou a great stay option is its close proximity to several golf courses, 13 km distance from Reus Airport and daily (live) evening shows and events. Rooms at the Estival Park Hotel come with all modern amenities and updated facilities. The 899 guestrooms at this Estival Groups owned property are broadly categorized into single use rooms, standard twin rooms and duplex rooms -- all complemented by a private terrace, plush bathroom, hair dryers, telephone, safety deposit box, satellite TV and air conditioning. From authentic Mediterranean buffets to a diverse range of international cuisines, there are 3 restaurants at Estival Park that cater to the taste buds of guests from all corners of the world. The hotel also has a piano bar, where you can unwind and enjoy live musical performances. There is an à la carte pizzeria that goes live when it is high season in Tarragona. A wine cellar, a tapas bar and 4 other snacks bars also cater to the food and drinks requirement at the property. You can also try out some of the best fusion drinks served by the 3 pool bars. 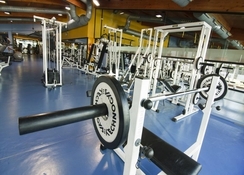 The Great Sports Centre at the hotel facilitates volleyball, tennis, indoor football, squash and several other indoor games. 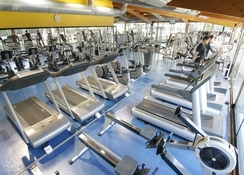 The gymnasium here boasts a host of state-of-the-art facilities supervised by professional trainers. 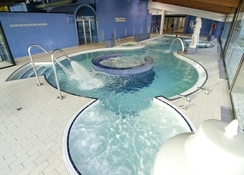 The hotel has got 4 swimming pools for adults and three for its young guests. There is also a Mini club for kids. The Aqumm Spa at the hotel has indoor heated pools and ice fountains while the spa facilitates steam bath, sauna and a range of spa treatments, beauty therapies and massages.